BLOOD TIES CHAPTER, CO-OP ENDURANCE, ALL DLC, AND MORE! In the critically acclaimed Tomb Raider, Lara Croft was forged into a survivor, but she glimpsed a deeper, secret world. Now, after uncovering an ancient mystery, Lara must explore the most treacherous and remote regions of Siberia to find the secret of immortality before a ruthless organization known as Trinity. 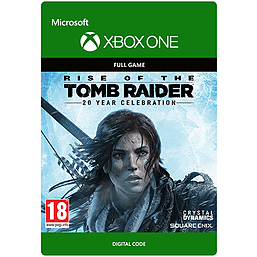 RISE OF THE TOMB RAIDER 20 YEAR CELEBRATION RISE OF THE TOMB RAIDER © 2015-2017 Square Enix Ltd. All rights reserved. RISE OF THE TOMB RAIDER, TOMB RAIDER, CRYSTAL DYNAMICS, the CRYSTAL DYNAMICS logo, EIDOS, EIDOS-MONTREAL, the EIDOS-MONTREAL logo, and LARA CROFT are registered trademarks or trademarks of Square Enix, Ltd. SQUARE ENIX and the SQUARE ENIX logo are registered trademarks or trademarks of Square Enix Holdings Co., Ltd. Nixxes and the Nixxes logo are trademarks of Nixxes Software BV. All other marks are properties of their respective owners.